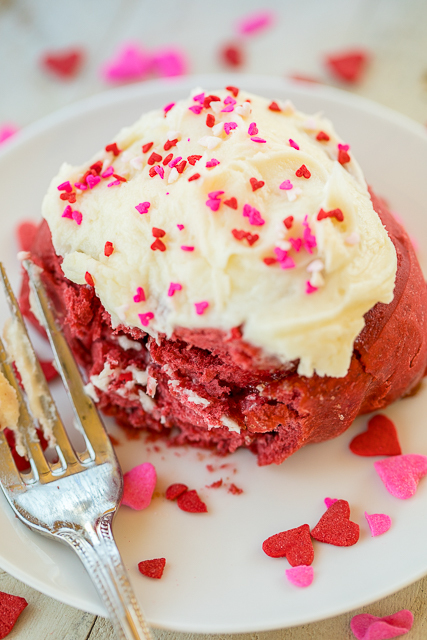 These Red Velvet Cinnamon Rolls are a MUST for your Valentine’s Day celebration. 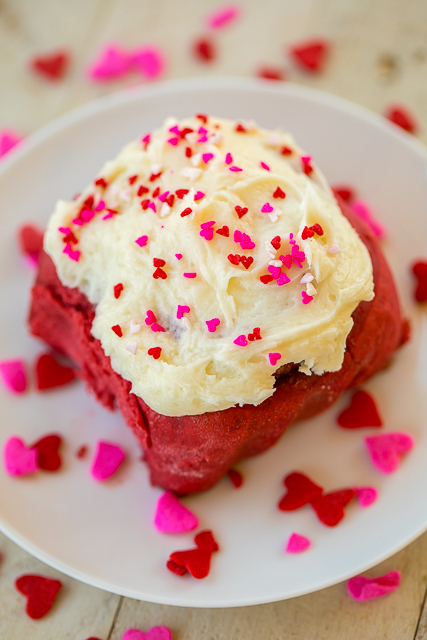 Nothing says “I love you” like red velvet cinnamon rolls topped with homemade cream cheese frosting. This recipes makes enough for two pans of cinnamon rolls. One for you and one to give away to a friend! 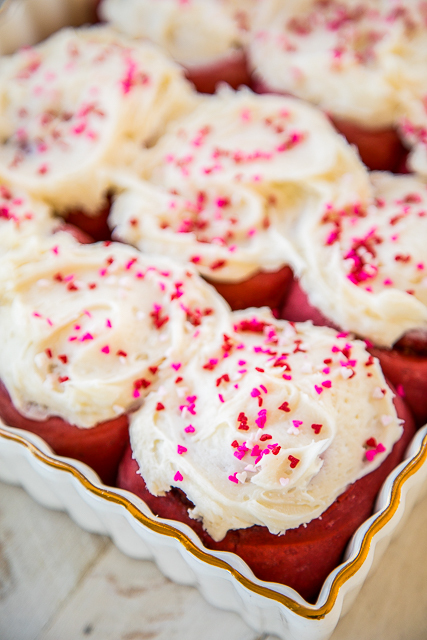 I like to make these Red Velvet Cinnamon Rolls the day before serving them. You can either frost them the day before or slightly reheat the rolls and then frost them. I usually frost them and then reheat the whole pan of cinnamon rolls. I am partial ooey gooey warm cinnamon rolls with warm frosting! 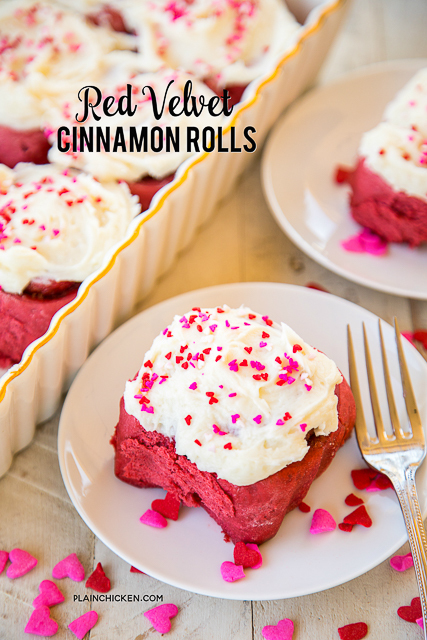 The base of these Red Velvet Cinnamon Rolls is a box of red velvet cake mix. Have you ever made yeasted bread with cake mix? 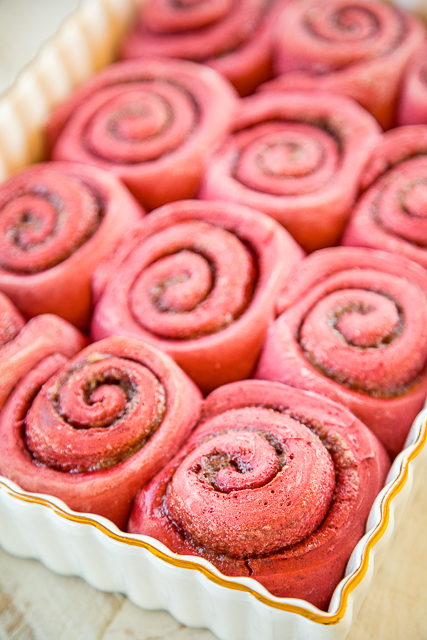 It is a great way to make lots of fun flavored breads - like these Red Velvet Cinnamon Rolls!!! The rolls were easy to make. It just takes a little time to let the dough rise a couple of times. It is totally worth it! I wanted to face plant in these Red Velvet Cinnamon Rolls! 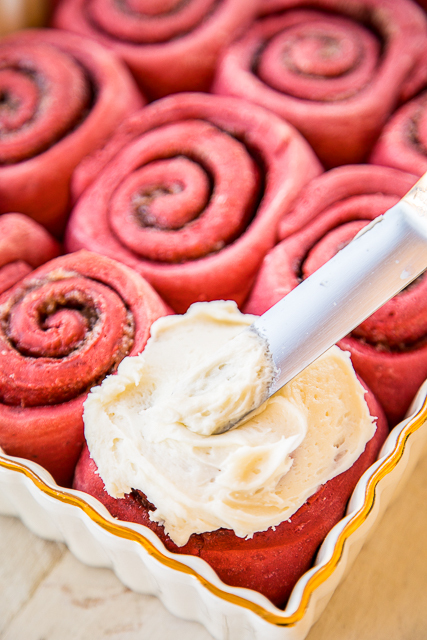 The homemade cream cheese frosting makes these Red Velvet Cinnamon Rolls to-die-for delicious! Give these a try for Valentine’s Day. I promise that you will fall in LOVE! In the bowl of a stand mixer fitted with the dough hook, combine 4 cups flour, cake mix, yeast and warm water. Mix until smooth. Adding enough of the remaining flour to form a soft dough. Mix an additional 3 to 5 minutes on low speed. Cover dough and let rise for 45 minutes, until doubled in size. Punch down dough. Turn onto a lightly floured surface; divide in half. Roll each portion into a 14x10-in. rectangle. Brush with butter; sprinkle with sugar and cinnamon. Roll up jelly-roll style, starting with a long side. Cut each roll into 12 slices; place cut side down in two greased 9x13-inch baking pans. Bake at 400° for 15 to 20 minutes or until golden brown. Cool for 20 minutes. Those look delicious. Can't wait to make them. Where did you get the teeny, tiny heart sprinkles?